I had three experiences of Christ that I can remember, from yesterday and today. When I was on the papal boat yesterday, and I saw the Pope come out of his car and wave with that big smile of his, it really touched my heart. Here is this introverted theologian who probably would rather spend his time on walks, playing the piano, reading his books, and here he is, speaking to the world’s young people. There was just something sweet about his presence and, of course, I know that he is Christ on earth. Thank you, Holy Father for your presence. When I was at the second Station, located at the Domain for the WYD 2008 Stations of the Cross, Judas gives Jesus a kiss. 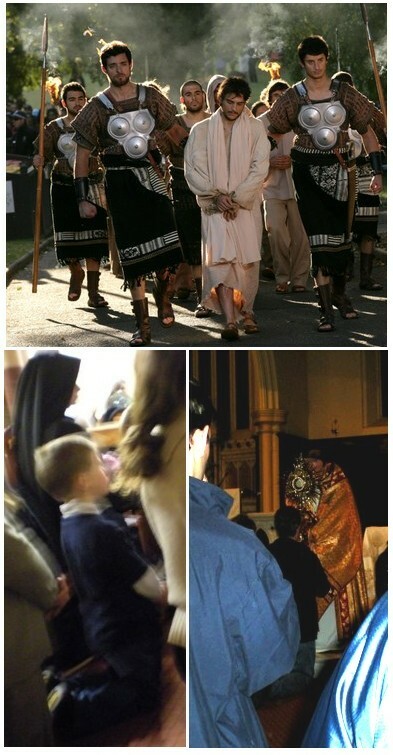 The Roman soldiers lead Jesus away down a path to the third Station, and groups of people run down by the enclosed path to see Jesus as he is being taken away. I found myself running, too, and I really felt like it was happening the way it happened when Jesus was taken away, because I betrayed him. I felt the sadness of that moment, the significance of that moment, in Judas’ life, in my life. Tonight, I went to Adoration at the Love and Life Site run by the Sisters of Life and sponsored by the Knights of Columbus. The aisle of the Church it was being held in was full of people on their knees, in procession towards the front of the Church where a priest was giving a personal Benediction to each one. A little ahead of me, a mother with two children around 4 to 5 years old was kneeling in procession with them. It was beautiful to see little kids knowing how to pray, knowing that Jesus is in the Eucharist. And there were all these Sisters of Life touching everybody’s life by their presence. It truly was a beautiful moment. I was running after Christ trying to see the Pope. I was running after Christ at the Stations. Ultimately, I never have to run after him. He is always there in very quiet ways.